Offering you a complete choice of products which include float and board level indicator gauge, float level indicator and float level gauge. “KABIR” Make Float & Board types Level Gauge are used for fluid level measurement in several industries. The Float which is of course the most important element of the instrument. In fact, its structural design, volume displacement, weight, and buoyancy force are all taken into careful consideration when a float is specified for a particular application. Often A typical Float & Board type Level Gauge is consist of a Float, dust proof Pulley Housing, Pointer cradle with nylon and 150 mm width screen printed Aluminum Scale. This instrument is an absolutely reliable and accurate system for liquid level measurement in tall overhead tanks. This type of Float & Board type Level Gauge basically work on the principle of buoyancy. The float is well connected to the counter weight along with a pointer through flexible wire ropes. The pointer slides along the guide against a graduated scale to indicate corresponding levels inside the tank. Most often, the Float & Board type Level Gauge finds its application in underground and over head storage tanks. They are also used in storage tanks of petroleum products, like furnace oil, diesel, and lube oil and so on. Also, it is used in storage of vegetable oils, molasses, silicates, glucose and so on. In short, the Float & Board type Level Indicator is most widely used in all non hazardous and non pressurized tanks. For Tank height more than 10 meter we provide Anchor Plated with Anchor Housing for Installing the Anchor Rope. “KABIR”also offers Vapor Seal Type Float & Board type Level Gauge which is generally used for tanks having corrosive fumes / vapors OR N­2 [Nitrogen] Purging tanks. In this level gauge the float is connected to a magnetized counter weight moving in a sealed S.S. OR PVC pipe & which drives a follower magnetized bi - color capsule inside a glass tube to indicate liquid level. The features of a typical Float & Board type Level Gauge can be detailed as follows. It has dust proof pulley housing. It comes with an SS bush bearing for a smooth rotation of pulley. The pointer cradle has 6 nylon rollers and adjustable brackets for easy mounting. It has a non corroding aluminum board with controlled cross section geometry and a wide painted scale with prominent multi color marking. The indicator of course, has a slack float with large diameter for higher accuracy. This level indicator is very easy to transport as well as install. Height up to 25 meters. Flanges : MS / SS / P.P. The features of a typical Float & Board type Level Gauge can be detailed as follows. It has dust proof pulley housing. It comes with an SS bush bearing for a smooth rotation of pulley. The pointer cradle has 6 PP rollers and adjustable brackets for easy mounting. It has a non corroding aluminum board with controlled cross section geometry and a wide painted scale with prominent multi color marking. The indicator of course, has a slack float with large diameter for higher accuracy. This level indicator is very easy to transport as well as install. Height up to 30 meters. Other require Longer height as per your request. 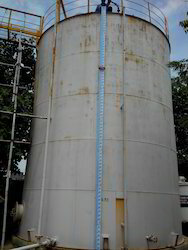 Highly driven by technical excellence, we are noted as the foremost manufacturers, exporters and suppliers of Float Level Gauge that is widely used for large Acid tanks & oil tanks, the indicator offered by us are precisely manufactured by our skilled workforce using the best quality raw material. We ensure our customers that the provided indicator is best from the other competitor's range. Packaging Details: Wooden Cages & Bubble sheet. Looking for Float Level Indicator ?